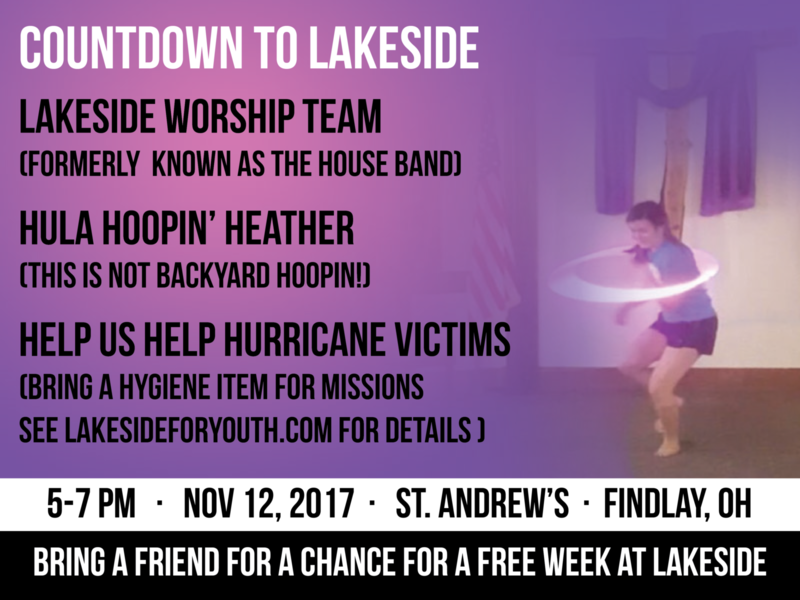 We hope that you can join us Sunday, November 12 at St. Andrew’s in Findlay, Ohio from 5 – 7 p.m. for our Fall Countdown to Lakeside. Reconnect with Lakeside friends, realign your mindset and actions to be focused on Christ and rev up for Lakeside 2018! Counting Down to Lakeside! The 51 weeks between camp last summer and this summer can seem like forever. Join us November 12 to reconnect, realign, and rev up! What kind of fun activities do we have planned for the night? The Lakeside Worship Team (formerly known as the House Band) will start the evening off with some familiar Lakeside worship tunes. Then Heather Brackman will perform Hula Hoop routines using led programmable hoops. We will have hula hoops on hand for willing participants to learn how to do a few of her moves. This isn’t what most of us have tried to do in the backyard. This is hoopin’ at the next level. Check out her performance at the Mendon United Methodist Christ Club last Spring. Then we will close the night with the Lakeside Worship Team. We are once again offering a chance for a free week of camp (for you and a friend) if you bring a friend to the Countdown who has never been to Lakeside For Youth before. The address is St. Andrew’s United Methodist Church, 120 West Sandusky Street, Findlay, Ohio. Please enter on the north or Crawford Street side of the building. The doors will open at 4 and food will be available. We hope you can join us! First – huge thanks to Lisa for posting all of this information!!! We look forward to hosing this event, and having you join us. If you can bring more than one of the above items, that would be GREAT!!! The more we can collect, the larger the impact we can have in Christ’s name. Lastly, our church address is 120 West Sandusky Street, but our main entrance is Crawford Street which is on the north side of the church. We have a large parking lot just to the west of the church, and there is a municipal lot across from our Crawford Street entrance. Let me know if there’s more information that you need by calling or texting me at 419-306-9604.